The Australian government has taken a u-turn on its harsh immigration policies by accepting a boat of Tamil asylum seekers on to its shores – the first boat to be accepted in more than six months. The 157 migrants have been waiting at sea for nearly a month for a decision, in which time Australia’s own High Court ruled against the government’s shameful asylum seeker policy which bans any migrants arriving by boat from being accepted on to Australian soil. By preventing asylum seekers from reaching Australian territory, rights groups believe the Australian government is dodging their obligations under international law, which require that all asylum seekers which arrive must be given due process. This morning the Guardian broke the story, reporting that the boat is currently headed towards the Cocos Islands, an Australian territory. 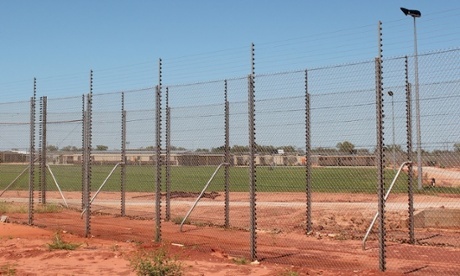 The Department of Immigration is then planning to move the group to the Curtin asylum detention centre in Western Australia (pictured), rather than the offshore processing centre on Christmas Island where previous groups have been held. The founder and CEO of the Asylum Seeker Resource Centre in Australia, which supports asylum seekers makes lives in Australia but also with policy lobbying and legal aid, was quick to put the decision into perspective on Twitter. Kon Karapanagiotidis tweeted: „After 27 days at sea I’m relieved the 157 are not going to be refouled but being sent to remote hellhole at Curtin just continues suffering. Social media has been alive with disdain for Australia’s hard-line immigration policies which were a key component of Tony Abbott’s successful 2013 election campaign. When news broke earlier this month that the Department of Immigration was considering using short teleconference interviews to assess the applications of Tamil asylum seekers still at sea, Australians across the globe were eager to make their voices heard. Sadly migrant boat voyages to Australia are part of a massive global trend of nations failing to protect asylums seekers in the way international law demands of them. What sets Australia’s policies apart is that they have actually legalised their ability to send asylum seekers back towards their persecutors, or even to other nations (Nauru, Papua New Guinea and, most recently, Cambodia) who have fewer resources and poorer human rights records. This High Court turnaround is significant, and we only hope this could be the beginning of a return to more humane policies in line with international human rights law.